Here are a few Vista features and my thoughts after a few days of use. The first thing I noticed with Vista is that stuff wasn’t where I expected it to be. This is not Windows XP, that is for sure. Immediately after I set up Vista I needed to see the Device Manager and I had no idea where to look. I have since found it by the way. But what I learned early on is that you can easily search for installed programs as well as files. You can see in the screen shot that I typed “Device” and as I typed the search started. The top item was “Device Manager” and it was highlighted so I could hit enter and it opened. That was easy. I have been using this to start most programs so far. I just finished installing IIS. 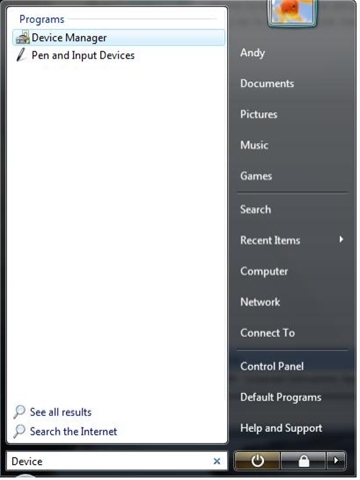 I couldn’t find the admin tool so I just typed IIS in the search bar. I heard about this but didn’t realize what it was. Every time you do certain things you get a security warning. So, for example, if I open the IIS Manager Vista prompts me with “Windows needs your permission to continue. If you started this action, continue.” I am sure there is a way to disable these messages but I have to admit, I feel more secure. We’ll see how long it takes before I get frustrated. My friend Gary from work has been showing me the ways of a sys admin. He taught me to use partitions for various files. He also likes to defragment the drives after making big changes. I’ve been following his ideas lately but found a snag with Vista. The Disk Defragmenter is pretty lame! You options seem to be (after you get past the security warning): a) Run defragmenter on a schedule or b) Deframent now. That is pretty much it. I don’t know what happens when you choose b. There are no options and no status update. Is it defragmenting all of my drives or just one? I assume it is doing all of them. I tried running it on a schedule but I don’t know if it worked. It was scheduled for 1 AM but my PC was asleep at the time so I think it skipped it. This morning I tried to run it manually. So I kicked it off and went to work. I came home to find out that the PC went to sleep and never finished defraging. This is pretty lame. I have heard that Vista manages the defragmenting for us now so I shouldn’t have to worry about it. I am not so confident in this. 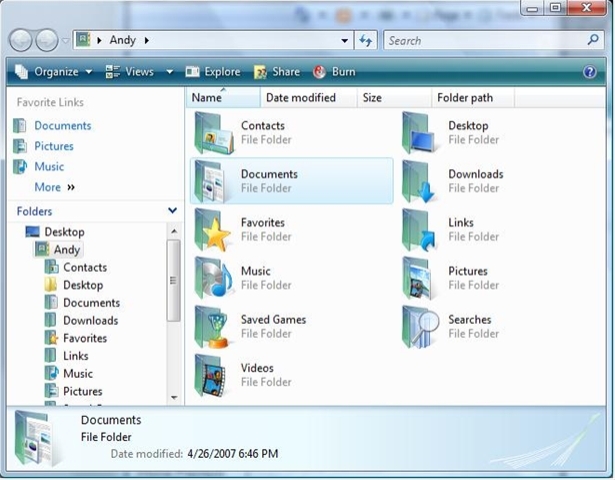 Windows XP had a folder for each user within the folder Documents and Settings. Inside each user is a folder for My Documents and inside that My Music, My Pictures, etc. I like to re-direct my “My Documents” to a different drive and that was easy to do. But you didn’t have a lot of control over the other “My” folders. It was all or nothing. 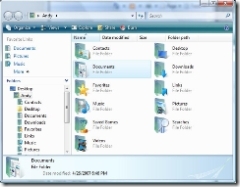 Vista introduces a Users folder. Inside that, each user has a folder, in my case it is called “Andy”. 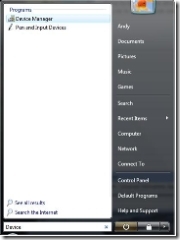 Inside that folder you will find folders named Contacts, Downloads, Documents, Music, etc. No more “My”…I like that already! Then I found out that you can easily re-direct any of these folders to a different location. So I put Documents, Downloads, etc on my D drive and I put Music, Pictures, and Video on my M (media) drive. And I can still use the shortcut on the start menu. I click “Andy” and I see all of my folders, even though they are located in different locations. This is very cool. To learn how to re-direct the files, read this post I found on Ed Bott’s blog (I don’t know him, found it with Google). Vista is Installed and Working – After a Few Bumps in the Road! Video: EVGA GeForce 6200LE 128MB (OR SO I THOUGHT) You can probably guess where this is going. Before I continue I should be clear. I am a programmer, not a systems guy. I can usually find my way with this stuff but I’m no expert with hardware, that is for sure. I ran a Windows Vista Upgrade Advisor and I passed so I figured everything would be all cool (did I miss a warning or fine print somewhere? In hindsight, I wonder). I popped in the Vista DVD and proceeded. By the way, I was warned to stay away from the upgrade and just do a full install. So I did. Vista installed really quickly so I was excited. In 15 minutes or so I was up and running Vista…sort of. Nice. You’d think they could have narrowed it down and told me why it didn’t work. After checking my device manager, I found that there were 2 devices that Vista did not like. One was the SM Bus Controller. The second was “unknown device”. I called Asus. I was able to get some information from them and was told to check out the NVIDIA site to download the driver for the SM Bus (System Management Bus). After the install, I was down to the one unknown device. I found some information by viewing the details page of the the driver properties window. The hardware ID was ACPI\PNPB006. Thanks to the magic of google, I determined that this was probably a GamePort or MidiPort that is not supported anymore with Vista. So I disabled it via the BIOS. Now I have no bad devices. I was feeling proud of myself for getting this far so I re-ran the Windows Experience assessment and… get the same error. Nice. My ego was really not doing well at this point. Since the error was rather vague, I spent some time upgrading various other drivers. I figured one would save the day. Upgrade a driver, run the assessment tool, upgrade a driver, run the tool. Yada yada yada, still no aero glass. I called EVGA. Turns out, my card does not have 128MB ram. The box said “Supports 128MB”. While I was on the phone with them I opened my PC to get the part number and found a tag that says 16MB on it. Uh oh, what is this? The guy on the phone could not explain to me why the box says “Supporting 128MB” or even what that means (pretty sad, huh). I later learned that it shares the some memory from the system but it doesn’t really have 128MB. 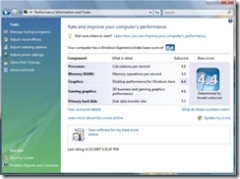 The bottom line is that it does not have enough video memory for the advanced features of Vista. Luckily, it is pretty easy to get hardware quickly. 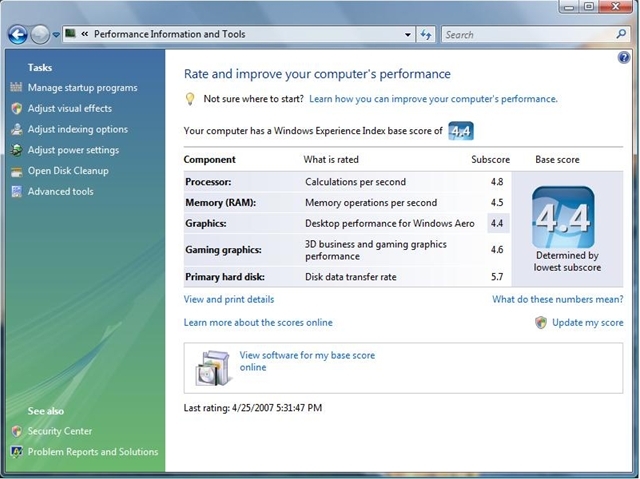 I hit Tiger Direct and ordered the card: XFX GeForce 7600 GS with 512MB DDR2. My biggest worry was that I’d get the card and find out I had some other problem. Two days later the card was delivered and installed. I wasn’t sure if I should be excited or not. I had it in my head that my rating would higher. But, this is enough to run all of the cool Aero Glass features of vista. Oddly enough, my cool new video card is the lowest scoring item. Do I need to increase my ranking? Supposedly a rating of 4 or higher is all I but now I admit I have rating envy. In the end the fault was mine because my video card was lousy. But here is what bothers me: the error “Cannot complete assessment”. Why not? Why couldn’t Vista tell me what the problem is? Maybe not specifically, but why not tell me there is a problem with my video card or driver or something more specific. At least I learned enough to ask the right questions before buying a graphics card. Did I mess with those device for nothing? Would it all have worked if I didn’t disable the GamePort? I guess it doesn’t matter and I learned a bit about devices from the experience. If you haven’t registered yet for Philly.Net’s Code Camp 2007.1 you are out of luck. This event is full! 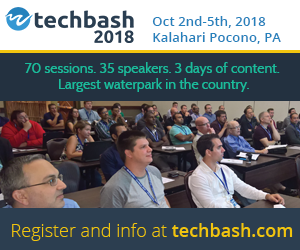 I am not surprised it didn’t take long for registration to fill up, there is a great list of presentations. A swag mans job is never done! For those of you who are registered, you’ll be glad to know that I’ve been working hard to make sure we have lots of door prizes. Many companies have been very generous with prizes for this event. It is really awesome that we have their support. Here is a sneak peek at some of the companies and prizes we’ll have. This list is unofficial and will change. Hopefully I’ll be adding more. If you have any ideas for swag, please contact me. I’ll try to keep this list updated as things change. Cizer 1 Full License for Drop In Reporting for every attendee! Red-Gate Software A copy of the brand new version of ANTS Profiler and two copies of SQL Refactor. Plus pens, t-shirts, memory sticks, etc. Sams/Addison-Wesley Books, t-shirts, bags, pens, quick reference cards. A few friends have asked lately about pasting code into blog posts from visual studio. When you do add code, you want to retain the syntax highlighting features from VS so the code is more readable. This is a snap with Windows Live Writer. Live Writer is still considered Beta software but it seems to work pretty well for me. All you need to do is go to the Live Writer Gallery and check out the cool pluggins that are available. In this case, I am using the pluggin called “Paste From Visual Studio“. //this method doesn’t really do anything. It couldn’t be easier! Now I just need to add some posts to this blog that really use some pasted code! Check out this other post I wrote about some other cool features of Live Writer. Posted in .Net, Blog, Microsoft. When I started this blog I continually went to Google to see if I came up in the search. I did some research and found that you can “register” your URL with Google. You can go to Google’s Add URL page and do the same. I am not sure if it worked or not. It could be that Google’s spider just reached me on its own. They make no guarantees that a URL added to the list will even get added to their search. Also, you can go to Google’s Webmaster Tools section. There you can see when the spider hits your site, find out what queries people use to find your site, and a whole bunch of other stuff. In my research I also found tips saying that I should include a lot of links in my blog posts. And also TrackBacks from other blogs would help my ranking with search engines. I can’t tell you if these tips worked specifically. But I do know that my posts are coming up in Google searches (and other engines too) and I am happy about that! By the way, some of the other search engines have similar tools to Google. But you’ll have to do a little research on your own to find them. Don’t forget to be a little patient. Posted in Blog, Technology, Web.